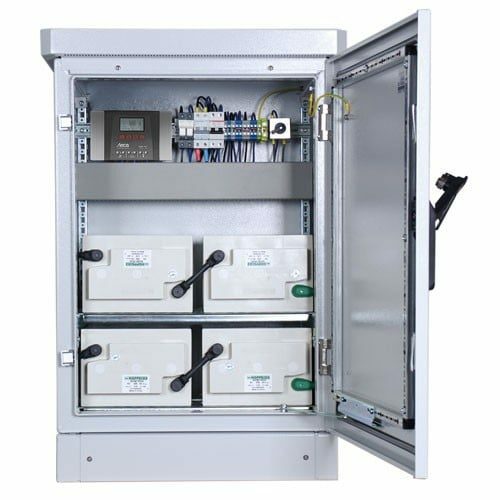 All electrical components are pre-assembled and pre-wired in a weatherproof control cabinet. Each system is tested and delivered ready-to-operate. The Plug‘n‘play concept of the Outdoor Power Pro DC L series guarantees a simple and error-free installation and commissioning on site. The Outdoor Power Pro DC L systems rely on solar charger controllers from Steca which guarantee optimum energy yields. The cabinets are designed for the use of Hoppecke sealed lead-acid batteries (solar.bloc/ sun|power VR M).